A v-neck colorwork vest in fair isle motifs. The vest is worked in round from bottom up. Steeking along the armholes and v-neck before picking up stitches for ribbing finishing. 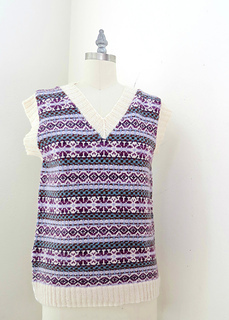 Sizes 30 (34, 39, 43, 47, 51, 56), sizes are based on chest measurements of finished garment in inches. 0 to 2” / 0 – 5 cm positive ease is recommended. Sample is shown with 1” / 2.5 cm positive ease. Gauge 30 sts x 32 rows = 4” x 4” / 10 cm x 10 cm in stranded colorwork after blocking. 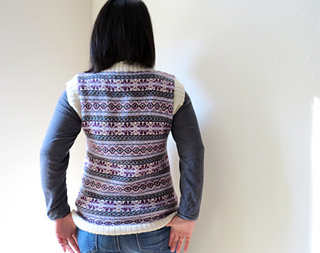 Design Simple V neck vest with fairisle motifs. 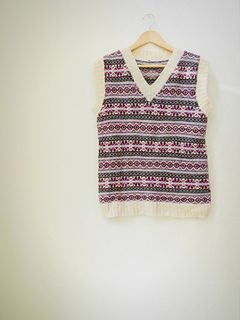 The vest is knitted in round from bottom up. 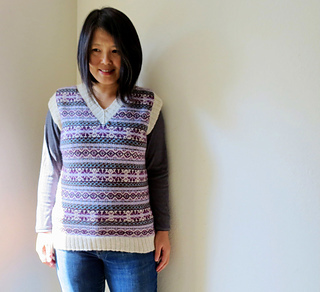 Decrease stitches for armholes and V neck. 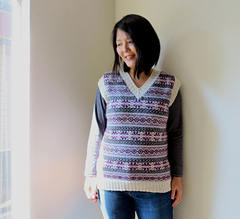 Join shoulders using 3-needle-bind off method. Pick up stitches around neck and armhole for 2x2 ribbing. Work 2-colors stranded colorwork for each row.